I have had a few months where I haven’t bought any new pens, but I’ve recently had a couple of opportunities to make some good deals on pens I’ve longed for. I jumped on the opportunities and sold off some pens that I felt that I could live without. Today one of my most wanted pens – the Pilot/Namiki Bamboo – arrived. I am a shape fanatic and this pen has such an exquisite shape which must be experienced in real life to really get it. It is a very three dimensional pen. As with the two earlier Pilot/Namiki pens that I’ve got it succeeds in uniting a special design with function and attention to the details. Superb. The combination of matte and glossy texture on the nib is beautiful, original and classy. I know that some people have experienced problems with the step between the barrel and section, but, since I hold my pens close to the nib, that is not an issue for me. It actually fits my hand like a tailor made glove. Lovely balance and the smooth F nib got enough of a tooth to fit my handwriting. I will not write a proper review on it until I’ve had it for a while – at the moment I’ll just sprinkle superlatives around me. I am so happy that the Bamboo seems to meet my ridiculously high expectations. Pilot has fast become one of my favourite brands – to my own surprise. I couldn’t resist taking a couple of snapshots of it. This entry was posted in design, fountain pens, pens, photo, pilot, Pilot Bamboo and tagged design, fountain pens, pens, photo, pilot, writing. Bookmark the permalink. Could you please post some update on your Pilot Bamboo? 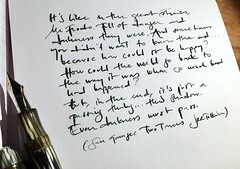 Also, I can’t wait to get myself one of those, and I’d like to know if it’s too light, as I like my fountain pens with that pro weight feeling.